Owners of Nikon D810s, Sony A7R2s and the new Canon 5DRs certainly have bragging rights when it comes to pulling out all of the stops (intended) and generating files that no other (cost effective) cameras can touch for absolute detail; but it all begs the question: "How many times during the course of the year do your commercial projects require the absolute measure in terms of pixel resolution?" If you are like most of us you love having the horsepower under the hood but you rarely use it to your advantage. I've been getting a lot of use out of 24 megapixel, full frame sensor cameras for my commercial jobs (Nikon D750, Nikon D610, Sony a850, Sony s99, etc) and I haven't heard a squawk of complaint from a single client or printer. No one has been demanding the issue from a D810 or its brethren. In fact, since we graduated from the barren realm of smaller, 12 megapixel imagers critiques about technical quality shortcomings have dried up completely. At any rate, either because photographers don't have endless budgets (or schedules) for storage and file massage I like to shoot in a "Ming Envelope" of sufficiency for the job(s) at hand. In 90% of the situations I encounter a file from an APS-C camera; either 16 or 24 megapixels of resolving power, is more than adequate to both fill the "Ming Envelope" of sufficiency and cover the postage to boot. So, in the flurry of camera buying I knew that the Sony flagship body (the A7R2) would cover the needs of my commercial photographer's ego as well as those times when clients actually do need as much pure resolution as I can cost effectively provide. But I also knew that I'd be happier, day to day, if I had a second tier camera to press into service for everything else. For that 95% of jobs which just need to be content perfect and technically adequate (or better) instead of aiming for perfectionism. In harmony with the A7 series, the e cameras, such as the a6000 and the a6300, are right in the sweet spot. This doesn't mean there aren't things about the form factors of these cameras I would gleefully change if I had the power to do so but it does mean that when I press them into service, photographing models for websites and tech equipment for multiple applications, that nobody is getting short-changed by my "downmarket" selection. On Tues. of last week I used the a6300, along with various lenses, to photograph black boxes on a white table top set. I chose the a6300 over the A7R2 because the smaller sensor in that camera provided an edge in depth of field for the same angle of view. The smaller camera (used on a tripod) also yielded a more compact set of raw files. Since our deliverables needed to NOT exceed 6,000 pixels on a long edge (tiffs and jpegs) the files from the a6300 were just right while files from the A7R2, if I had used that camera, would have had to suffer the indignities of being much reduced in size. Another step in the process. Later in the week I had fun photographing models with belts. Again I weighed my equipment options and settled on the a6300. In the studio the same arguments I made above applied. There's a limit to how many jobs are handled effectively by nearly infinite resolution. Especially when every file generated is intended solely for a web site or a web catalog. With the a6300 I was able to shoot all day long with the 18-105mm f4.0 G lens. While I am certain that more biting and contrasty lenses exist I am happy to say that this lens, coupled with the range of tools in my post processing applications, leaves absolutely nothing to be desired for whatever commercial work falls within its generous focal length ranges. I'd love to say that I took advantage of the lens's and camera body's joint image stabilization and that this feature made all the difference in the world but....I'd be lying. We had the camera on a tripod with a fluid head in the studio (I.S. off) and in the exterior work I was happily shooting at shutter speeds like 1/1,000th, which also obviated the need to let the camera conscientiously jiggle the sensor around to compensate for my decades long coffee habits. High shutter speeds are their own reward. While fans of alternate camera systems are quick to the debating stage with negative points to share about the ubiquitous Sony npw50 batteries I will again say that the a6300 was downright parsimonious on Thurs., allowing me to knock out some 2,000+ images with two batteries (charge remaining on the second one...). If you love to chimp I doubt you'll do as well on power management. My flaw as a shooter is that I seem to fire off far too many nearly identical frames in the hopes that somehow the imaging gods will intercede and bless me with an (accidental but no less valuable) keeper selection of images, based on my repeated and diligent use of the shutter button. This leads to more quantity of shots per battery than a slow motion flurry of highly considered, individual shots; well and thoroughly examined. I can't begin to tell you the pleasure in holding just the a6300 and the 18-105mm f4.0 G lens for the afternoon versus the alternative of holding onto the A7R2 and the matching 70-200mm f4.0 G lens; or, even worse, the Nikon D810 paired with an 80-200mm f2.8. Just a different world of happiness. No aching biceps the next day. No neck pain from the strap of a heavy camera and lens at rest. The a6300 is also a faster camera to use than the A7R2. I don't usually think about stuff like frame rates since I rarely shoot sports but even with the talent paddle boarding or jogging, the eight frames per second of shooting, with full on live view, makes working with the slower frame rate of the higher res cameras seem plodding. For pure, productive laziness nothing really beats an 8 frame per second, live view-enabled, camera with an EVF and face detection AF. I could shoot this way ensconced in my lakeside cabana while lying on my side eating grapes, being fanned by comely assistants, and still come out with a respectable number of winning photographs. Now, remember, I am not singing the praises of the a6300 because I am impoverished, under equipped, and jealous. I actually own an A7R2 and a nice group of lenses for the camera. But sometimes it's just not the right tool to grab. There are just two situations in which I reflexively grab for the bigger camera. The first is when I want to pop an 85mm or 105mm on the front of the full frame sensor and test the limits of narrow depth of field. The second, and most obvious, is when I need or want enormous RAW files---filled to the brim with resolution/data points. The a6300 (and the a6000 before it) do such a nice job on everything else. The flexibility and performance made the a6300 my "go to" camera all week long last week. There were two "use" exceptions. On one hand I brought along the RX10 (classic version) to my belt wielding model shoot just for video. The 1080p video in that camera is really superb and I've shot with that camera enough in video mode to make the operation more or less seamless for me. The other exception was my use of the A7R2 to shoot a "family" shot of four communication server boxes together, on white seamless background paper. I didn't really need the singular attributes of that camera for the shot but I was curious to see how much of a difference the higher resolution and the logo-enhanced performance of the Zeiss lens would deliver. If you peeped at the pixels at 100% you could see a small difference between the 24 and the 42 megapixel sensors. In real life? At the size of the deliverables? Any difference would have fallen into the placebo category, for sure. So, my camera of the week, for my commercial business, was the a6300. Does that mean it's the best camera for everyone to use all the time? Hardly. It has its faults and they mostly revolve around the ergonomics of the body design. They made the body too small! The finder could use more eye relief/stand off as well. But the sensor is really good, and I've already mastered the menus so I feel at home making the camera do my bidding. I could have easily done the same work with an Olympus EM5.2 or a Fuji XT-1 or Pro-2 and some of those juicy Fuji or Olympus lenses. But, the ego needs of the A7R2 saddled me with my current selection of APS-C cameras by dint of wanting to rationalize the lens choices over a complete family of bodies. 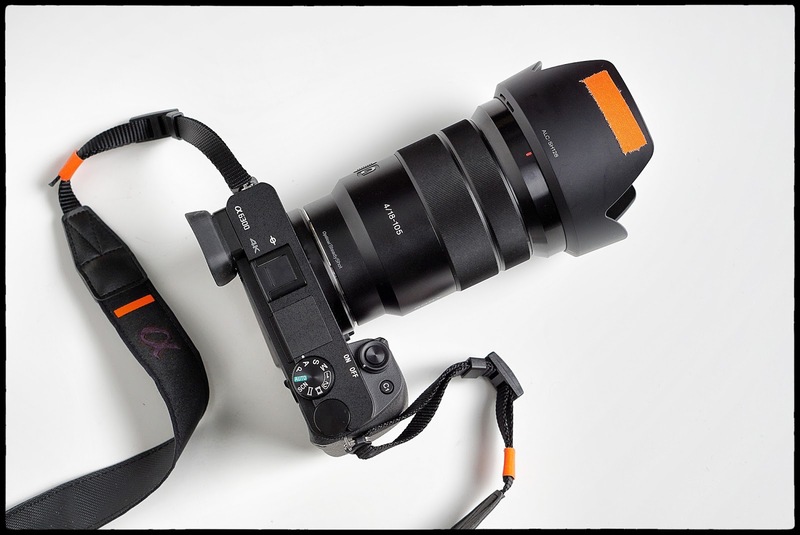 I wish that Sony would just take an RX10ii body and put an APS-C sensor in it. Same focal length selections and speed. The body might have to be just a bit bigger to accommodate the geometry of it all but I wouldn't care, I'd be happy as a clam. At least for a while. What a glorious time to be alive and near a perfect swimming pool. Oh yeah, and to have cameras.